Training and test to become a chauffeur, minicab driver or an Uber driver. Test & certificate £50 issued on the same day. 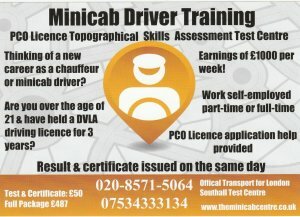 Fully Licensed and accredited by TfL as a PCO operator and Topographical Skills Test Centre. Become a London Private Hire Driver (chauffeur, minicab driver or even a Uber driver) and have earnings of £1300+ a week. We can train you to become a licensed London PCO driver, we can also help you with your application to TfL for your PCO Licence. Once you have successfully passed your assessment and received your topographical skills certificate you will be on your way to applying for your licence. Medical and Eye Test with a TfL approved doctor. We operate 24/7, however booking is required, weekend evening classes available. Please give Mr Khan a call on 02085715064 or directly on 07534333134.